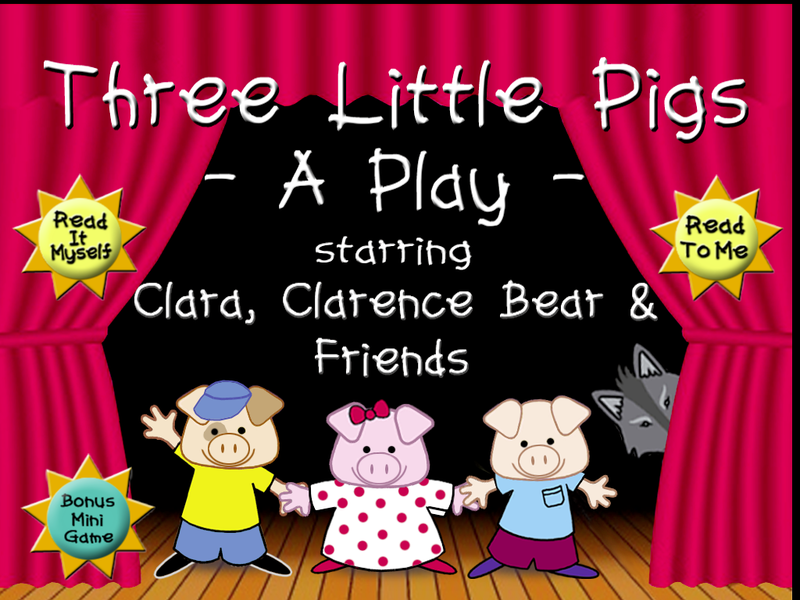 For ages four and up, this totally interactive story book starring Clara, Clarence Bear and friends offers a fresh spin on the classic fairy tale of the "Three Little Pigs." The unique format of characters playing characters in a stage production will delight both children and their parents. Clara plays "Rosie"; Mitch plays "Sterling"; Ryan plays "Floyd"; and Clarence Bear is the "Big Bad Wolf". See how the pigs fend for themselves as winter approaches, preparing shelter from the cold weather and the mean Wolf. Will all three pigs survive both? The story can be either listened to or read without narration. Following the story is an optional game, "Match Up," that tests memory and concentration in a fun and entertaining way, using the story graphics.